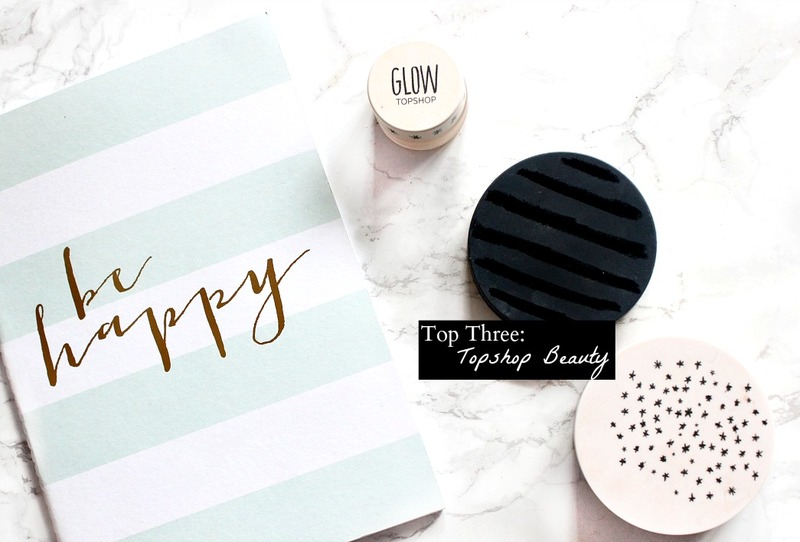 Hello everyone, its been quite a while since I've typed up a top three, so today I am going to be sharing my absolute favourites from Topshop beauty. 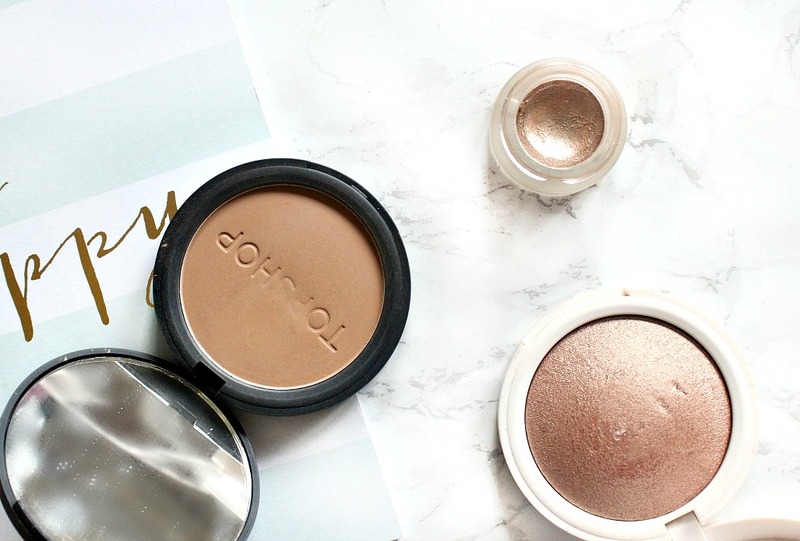 The purpose of these posts is to whittle down my makeup collection to the best of the best from each category, be that a whole brand or simply my favourite golden highlighters for example. I have tried quite a few things from the Topshop beauty line and so it was tricky to limit this down to three products, but if push came to shove the following are definitely the items I'd repurchase in a heartbeat. This is my favourite 'highstreet' bronzer by a thousand miles, I am totally smitten with it. Its a little darker than Benefit's Hoola and a little warmer but not orange in the slightest, which makes it the perfect everyday bronzer for me. When I first saw this bronzer in the pan I felt very ehhh about it, I had gotten into such a habit of opting for grey-toned bronzers over warm bronzers that I pretty much dismissed it. So I'm really glad that I finally put down Laguna and Hoola and gave this a go, because I really haven't looked back since! As the formula is completely matte, it looks very natural on the skin and it blends so well. There is no chalkiness, streaks or patches when you apply this. The formula is very comparable to that of a high-end product and I find it looks lovely with my lighter foundation shades and when I opt for a warmer shade too. The large mirror on the inside is fantastic and I do like the sleek yet cute looking black packaging. You get an impressive 10g of product, which is great value for money considering a full sized Hoola costs £23+ for only 8g! I have spoken about these little pots of joy many a time here on my blog, they are wonderful! Glow pots are cream highlighters in the cutest little frosted glass packaging, which blend in so well and look stunning worn alone or under a powder highlighter. I LOVE highlighters, but I recently had to have a clear out and both shades I own managed to stay in the stash. The reason I picked gleam over polish is because it is more of a golden shade and I reach for it often. I love how quick and easy it is to use these, with the tips of my fingers just patted onto the tops of my cheekbones and nose. Its also very versatile and I often use it as a base for a powder highlight when I want a strobed look. Gleam is definitely one for those of you who have a warm/olive skintone and although the pot looks small, a little goes a long way. I have been using this for well over a year and still have quite a bit left! 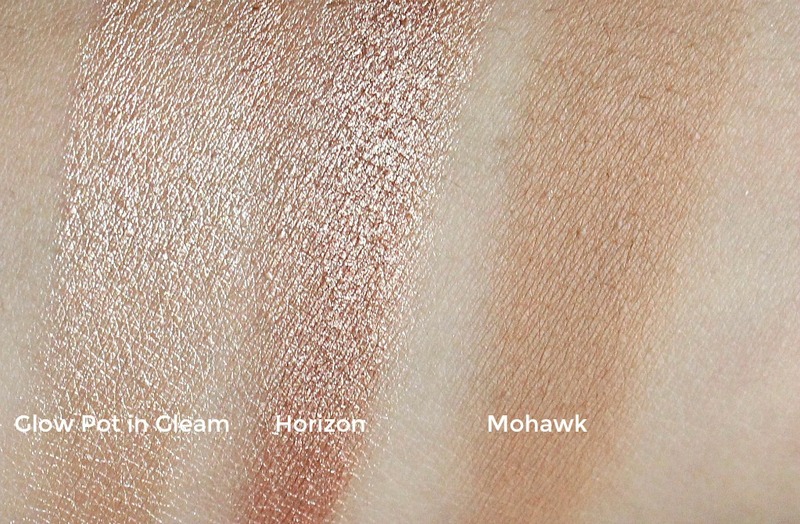 One of the most unique highlighters in my collection, Horizon is a sort of rose gold/bronzy shade and when I looked at it in the pan I wasn't that impressed. However when I swatched it, the baked formula lead to a beautiful silky finish without a single bit of glitter in sight. Thanks to the lack of shimmer or glitter, its one of those bronzers that works really well if you have a lot of texture on your skin, because it doesn't emphasise it at all. I also think this is a lovely highlighter for everyday, sometimes when I go for my typical golden shades and then step out into the daylight I realise I've over done it for an average day. However I think the unique shade of this makes it difficult to go over the top, and if you did keep layering it would no longer look like highlight - it would appear very dark. So you simple need a small amount to create a beautiful sheen on the skin and I can't get enough! So in a nutshell (or a few haha) those are my top three products from Topshop and each of these I would repurchase straight away! Gleam and Mohawk are great for light-medium skintones and horizon I'd recommend for medium-deeper skintones. What are your favourite Topshop beauty products?